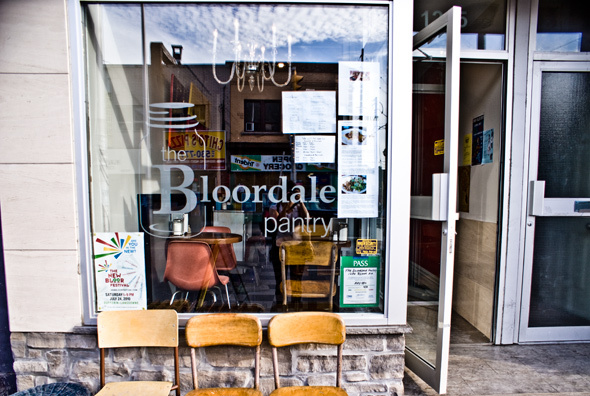 The Bloordale Pantry, on the corner of Bloor and Landsdowne, was a diner for 60 years (most recently Dale's, a Bloordale Village staple in terms of questionable hangouts) before new owners cleaned up the time worn space, sourced antiques from local stores like Ping Pong, and transformed it into a modern diner inspired by the original concept. "We found so many trinkets and treasures in drawers and in the basement when we cleaned the place up," the owner tells us, chatting casually with the customers just like you might expect in a local diner. The inside is cute and kitschy, with vintage furniture and lighting. 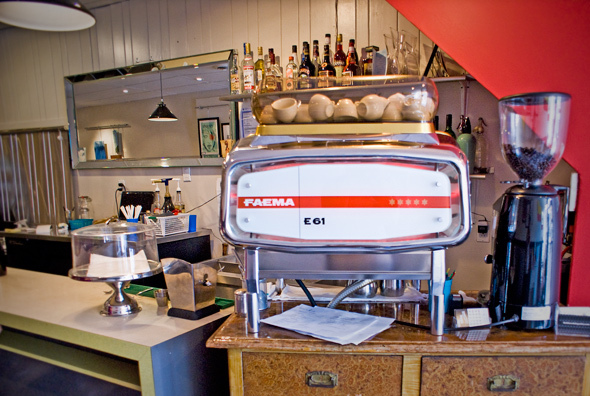 A beautiful reproduction of a classic Faema espresso machine sits on the bar. 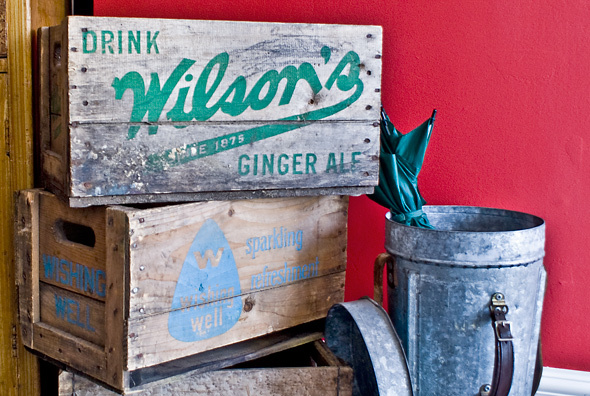 The bar offers a simple selection of drinks and fresh juices, as well as a couple classic cocktails. 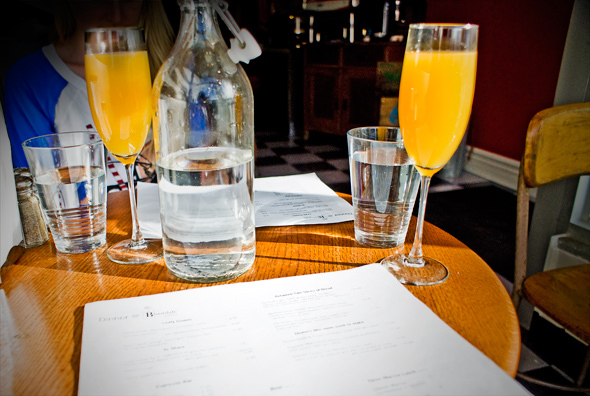 We select the Peach Bellini ($6) from the 'Three Martini Lunch' list, a refreshing mix of peach nectar and prosecco. After examining the small, diner-inspired menu, we decide to start the meal with the Lazy Susan ($7/person), an assortment of meats and cheeses. When the platter arrives, we're walked through the selections, which include Quebec goat cheese, Saxon cheese from Wisconsin, soppressata, chorizo and salami. We're encouraged to try the goat cheese with the accompanying mission figs, and as promised, the combination is delicious. I've never had Saxon cheese before, and it's fantastic, pairing well with the mildly spicy meats. The platter also includes pieces of tasty house-made cornbread, fruit, olives and pickled jalapenos. 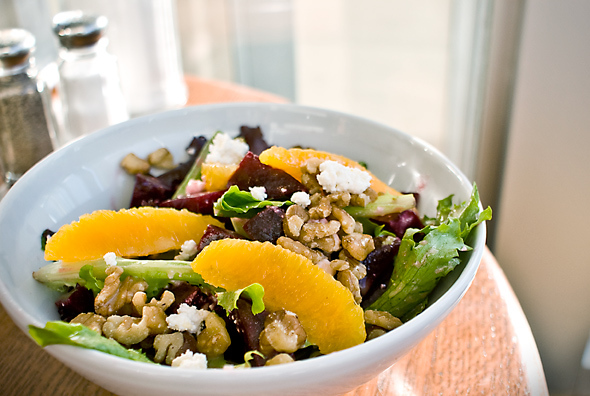 Next arrives the Beet Salad ($6.99), consisting of mixed greens, orange segments, beets, feta and walnuts. The beets are a little crunchy, but balance out the salty feta. The salad has a nice variety of textures, though the dressing could use more flavour. 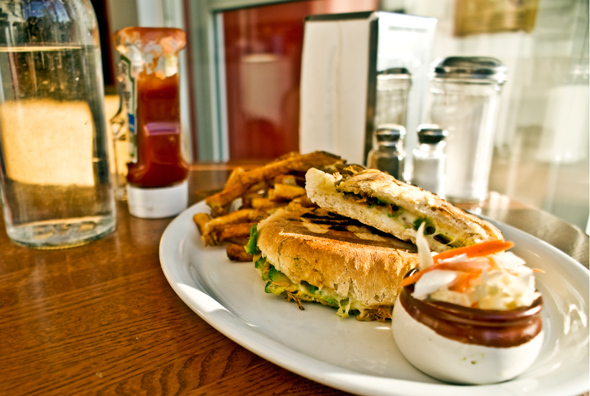 The Boada ($11.49) is a sandwich consisting of twelve hour slow-cooked pulled pork, pressed panini-style with avocado and mozzarella. The avocado and melted cheese add just the right amount of creaminess to the sandwich as there appears to be little or no sauce on the pork. This sandwich is simple and satisfying, and sided with some excellent fries. They're just like chip truck fries with the skin-on and thick cut. I continue to pick at them long after being full. 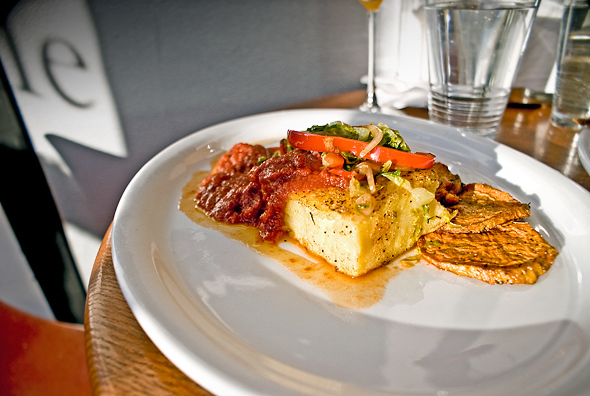 We also try the Seared Polenta ($9.99). This classic cornmeal dish comes topped with San Marzano tomato sauce and sautéed greens, red pepper and onion, with a few slices of roasted sweet potato on the side. Separately, the components are good; the tomato sauce and the veggie sautee are sweet, and the texture of the polenta - crispy on the outside and gooey on the inside - is comfort food on a plate, if somewhat bland. The spiced sweet potatoes that come with the polenta are crispy but not enough so to save this dish. Somehow the combination of all these flavours just isn't quite right. 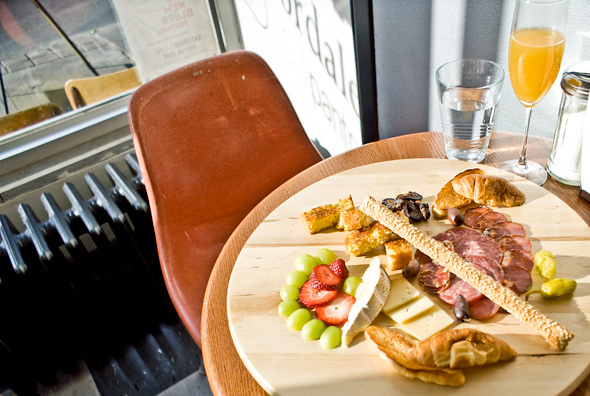 A friendly resto with a welcoming vibe and a casual, diner-style menu, The Bloordale Pantry is open for lunch, weekend brunch, and dinner.